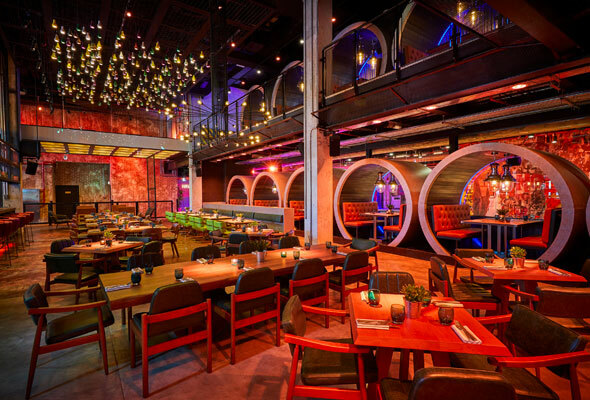 A major new dining and entertainment venue is set to shake up things at Atlantis The Palm when it opens on February 1, and we’ve had a first look inside. Called Wavehouse, the new complex is split between indoor and outdoor activities and comes complete with a restaurant, terrace and adult-only bar, as well as endless family-friendly fun to keep little ones (and grown ups) busy. 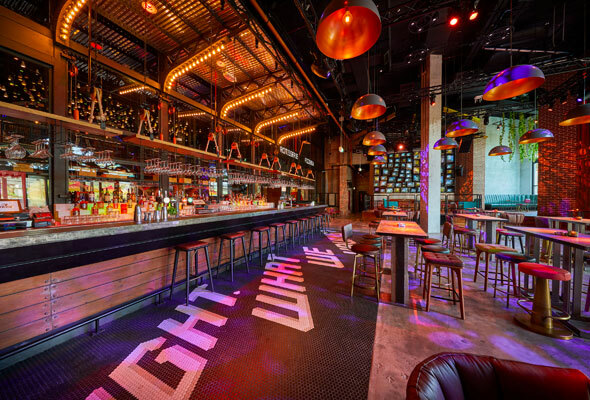 Described as a ‘first-of-its-kind for Dubai’, Wavehouse is an entertainment venue that brings together live music, gaming, bowling, drinking and dining, all overlooking a state-of-the-art wave machine. Located in The Avenues at Atlantis, the super sized venue is split cleverly into distinct spaces, and overlooks Aquaventure Waterpark. So, what exactly will you find inside? 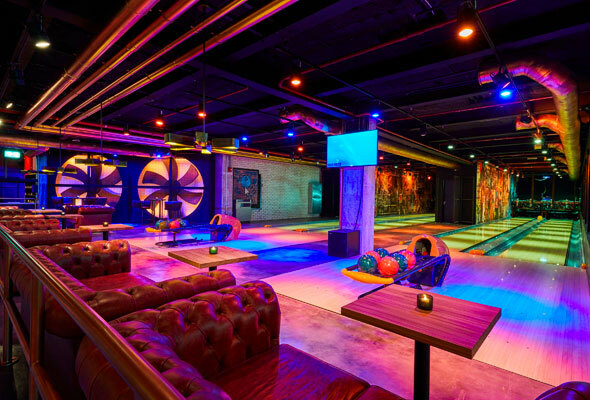 Perfect for kingpins, seeking a strike, Wavehouse’s four-lane ten-pin, licensed bowling alley is designed for kids and adults. 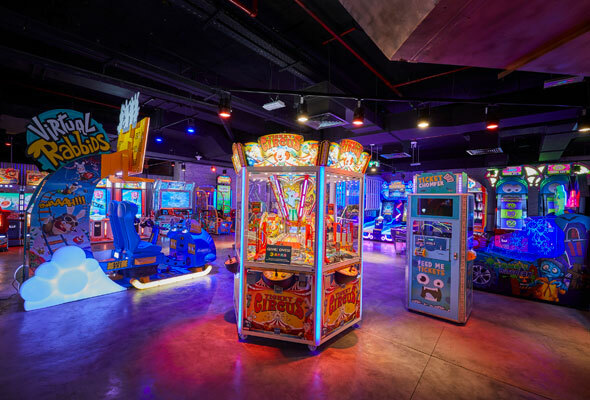 With funky visual 3D mapping projections and plush couches, lanes can be hired from Dhs360 per hour (maximum 6 guests) or Dhs60 per person per game (walk in only). 12pm to 1am daily. All ages. Bowling shoes included. ‘LEVELS’ is designed for children and young adults of all ages. The soft play zone is for children over one metre tall, spans five levels, and is kitted out with padded mazes, super slides and climbing frames. LEVELS arcade games spans two floors, and is open to all ages. There’s over 50 games to choose from, which include the world’s largest Pac Man, the world’s first 3-axis rotation simulator ‘Stereo VR’ and Zombie outbreak, which uses a huge water gun to spray real water as the creepers approach. Gamers can also enjoy the dedicated Xbox playing zone, featuring the famed ‘Fortnite’, and a multi-function party/kids’ room. LEVELS soft play, 12pm to 1am daily. Minimum height 1m, Dhs75 for full day pass. LEVELS gaming, 12pm to 1am daily. All ages. Packages from Dhs200. 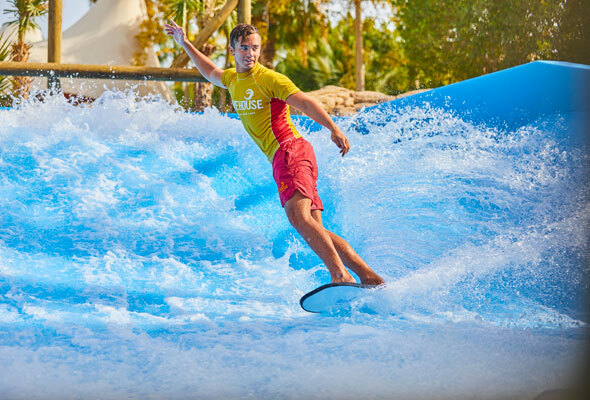 The first Wave Rider in the GCC is designed for all ages, and is found adjacent to Aquaventure Waterpark. Guests can either join in on the fun with an unlimited access pass for Dhs100 per person, or watch from the sunny terrace. Designed to produce a realistic wave evect for body boarding, knee boarding, or surfing for pros, it shoots out more than seven tonnes of water per second, forming a thin sheet across the moulded foam structure. 10am to 6pm daily. Free use for Aquaventure guests, Dhs100 for Wavehouse guests for unlimited use. 6pm to late, Dhs100 per person for one hour of unlimited rides. Riders must be over 1.2m to body board and 1.3m to surf. The adult-only bar and family terrace is a perfect spot for chilled-out afternoons that turn into lively evenings. There will be live music and DJs three nights a week on Monday, Wednesday and Thursday, as well as a daily happy hour from 5pm to 7pm, and brilliant new Tuesday ladies’ night, which as well as offering three free beverages to ladies from 7pm to 1am, will also include access to LEVELS gaming, 50 per cent discount at the bowling alley, and a ride on the wave machine. 120pm to 1am daily. No children on the terrace after 11pm. No children permitted on the terrace after 23:00pm daily. Open daily for lunch, dinner and late night, the Wavehouse menu caters to both the health-conscious and comfort-food seekers, with a gourmet gastro menu that serves up everything from gourmet burgers, mega shakes and pizzas to fresh salads and light bites. Signature dishes include the Deep Fried Babybel and rainbow sliders, while those with a sweet tooth can indulge in fully-loaded waffles and white chocolate chip cookie dough, as well as towering sundaes and soft-serve ice cream with toppings. There’s also a dedicated kids menu, and soon-to-launch family-friendly Friday brunch packed with gastro food, live music, gaming and bowling. Food is served 12pm to 12.30am on weekdays, and 12pm to 2.30am weekends.